Updated 8/25/18. 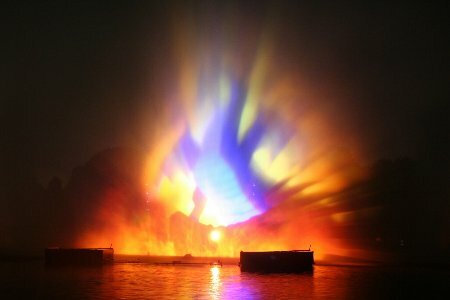 This article is a complete guide and review of Fantasmic!, the ultimate in nighttime entertainment at the Disneyland Resort in California. Throughout this ultimate guide, we feature the best ways to watch the show, short history, and seating tips. Did we miss something amazing? Share your tips & tricks below and on our Facebook page. In 1992, Disneyland’s entertainment department was given the challenge to come up with a new nighttime spectacular, utilizing the Rivers of America. The result was Fantasmic!. 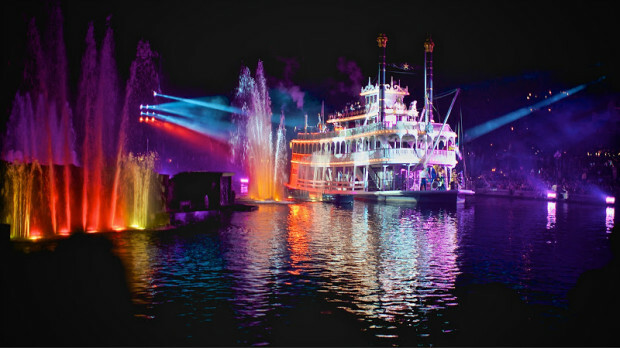 The show includes: fireworks, live performers, water effects, pyrotechnics, music, a few watercrafts, decorated rafts and projections onto extensive mist screens emphasizing reworked Disney animation. It was one of the first of its kind to incorporate all the elements into one amazing performance. A significant part of the area around the Rivers of America was required to be revamped, including terracing the walkways to accommodate viewing and changing the front section of Tom Sawyer Island (now named The Pirate’s Lair) with the goal that it could act as a stage for most of the show’s live action. The show was originally set to run for 5 years, due to the popularity with the resort’s guests, it has regular showings more than 20 years later at Disneyland in the Disneyland Resort, Disney’s Hollywood Studios in Walt Disney World and Tokyo DisneySea in Tokyo Disney Resort. 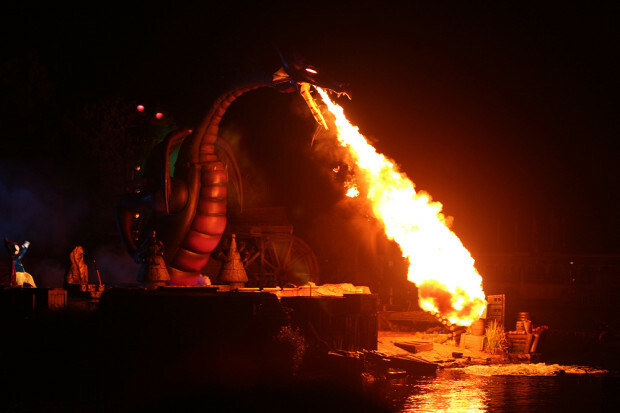 In this article we will be focusing on the showings of Fantasmic! at the Disneyland Resort in California. One of our renowned Disney experts, Kim Shultz, from Mickey Visit lends her expertise on the show itself, up to date tips on viewing, and everything guests need to know for the current Fantasmic! season. Along the shores of Tom Sawyers Island, within the waters of the Rivers of America, Mickey Mouse creates a spectacular show using his brilliant imagination. Mickey transforms into Sorcerer Mickey where he conjures up clips from some favorite Disney movies – Fantasia, Aladdin, The Lion King, Tangled, and Pirates of the Caribbean – all on streaming screens of water. Live action scenes come alive with such characters as Aladdin and Jasmine emerging from the fog to delight guests with their musical carpet ride; the Sailing Ship Columbia sails by with a ghost crew of pirates right out of the movie Pirates of the Caribbean; and rafts adorned with colorful lights float down the river carrying such princesses as Beauty dancing with Beast, Rapunzel with her prince, Flynn Rider, and Ariel with her love, Eric. Where there is good, there is always a whole lot of bad. When Mickey is pulled through the magic mirror, things turn dark. Enter a fantastic show featuring some of Disney’s most infamous villains. Mickey is forced to fight an angry 45-foot dragon, which is the highlight of this amazing show. Of course, with all things Disney, the good prevails. In an epic finale, the Mark Twain Riverboat paddles its way along the river dotted with every Disney character imaginable. Words alone cannot materialize the images all the fascinating water effects, lasers, pyrotechnics, fireworks, and live action scenes Fantasmic! brings to life. For a literal play-by-play of the show itself (Note: SPOILERS! ), check out this Wikipedia article. Or, the easier approach: Check out the video below! Fantasmic! lights the night sky from the shores of Tom Sawyers Island and over the Rivers of America in Frontierland. The show runs for 27 minutes and during peak seasons there are two nightly shows, 9pm and 10:30pm. Of course, it is always a good idea to check the Disney app, Disney website, or Park maps to insure that times have not changed or shows have not been cancelled. During off seasons, Fantasmic! show times vary so check the Disney app for the most up-to-date schedule. Fastpass distribution for Fantasmic! begins when Disneyland opens and must be obtained in order to secure a guaranteed spot to view the show. Distribution kiosks are located along the Rivers of America adjacent to Frontier Landing. Fastpasses for the first show are distributed until they are sold out before the second show time Fastpasses are distributed. Remember that Fantasmic! Fastpasses can be held concurrently with all ride Fastpasses. Viewing takes place along the wrought iron gates that surround the Rivers of America in Frontierland and New Orleans Square. Prior to each show, three viewing sections are roped off: dining packages viewing, Fastpass viewing, and standby viewing. The dining packages have the best viewing placed right in front of the stage along the Rivers of America. All Fastpass holders and preferred dining packages near the iron gates are able to sit to view the show. Standby viewers must stand to view the show. Of course this may change depending on crowds so plan accordingly. Ask a Cast Members what is asked of you when you check in! Plan to arrive 45 minutes to an hour before the show starts (although your Fastpass will tell you 30 minutes) because it’s first come, first served in your section. And right in front is always the best place to be! Although you do not need a Fastpass or dining package voucher to view Fantasmic!, standby areas fill up fast and do not guarantee you a place to view. Guests with disabilities should not rely solely on the viewing area Disney designates for guests with disabilities. This area, near the Haunted Mansion, does not provide the best view of Fantasmic! Instead, guests with disabilities should obtain a Fastpass or obtain a dining package voucher and arrive at least an hour before the show starts. Cast Members will assist guests with disabilities and their family on where to go in their designated area. Well worth the extra money are the Fantasmic! dining packages that are available for your convenience. The Blue Bayou, River Belle Terrace, and Hungry Bear Restaurant offer guests wonderful options with the best seating to view Fantasmic! The Blue Bayou Fantasmic! 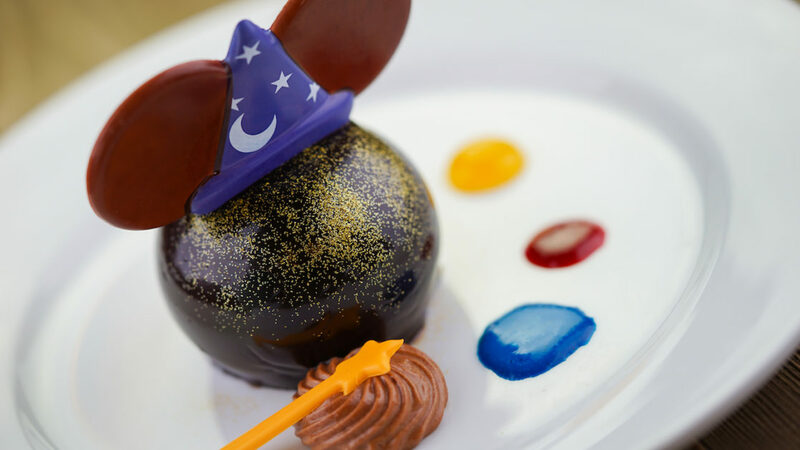 dining package offers guests a 3-course meal (starter, entrée, and dessert), an 18 x 18 foam cushion to sit on, and a voucher for a designated viewing of Fantasmic! Each guest in your party must purchase a dining package to receive a voucher. Having purchased this package in the past, I must say that it offers the best viewing of Fantastic! and is well worth the money spent! 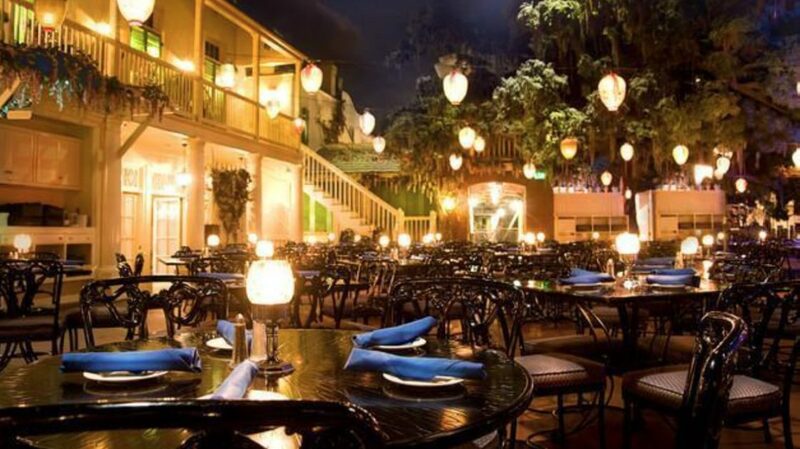 Reserved seating at Blue Bayou Restaurant begins daily at 11:30am for lunch and 4:00pm for dinner. Lunch is $59 per adult; $29 per child (ages 3 to 9) – tax and gratuity not included. Dinner is $69 per adult and $29 per child (ages 3 to 9) – tax and gratuity not included. The higher price you pay with this package gets you the best viewing, right in front of the stage. The River Belle Terrace package includes a 3-course dinner (starter, entrée, and dessert) and reserved seating begins daily at 4:00pm. Dinner is $45 per adult and $25 per child (ages 3 to 9) – tax and gratuity not included. Another great option with the River Belle Terrace option is the opportunity to upgrade to premium 8:00pm seating for an additional $25 per adult and $15 per child (ages 3 to 9). Guests can enjoy their meal as well as the first performance of Fantasmic! from their seat on the outdoor patio! 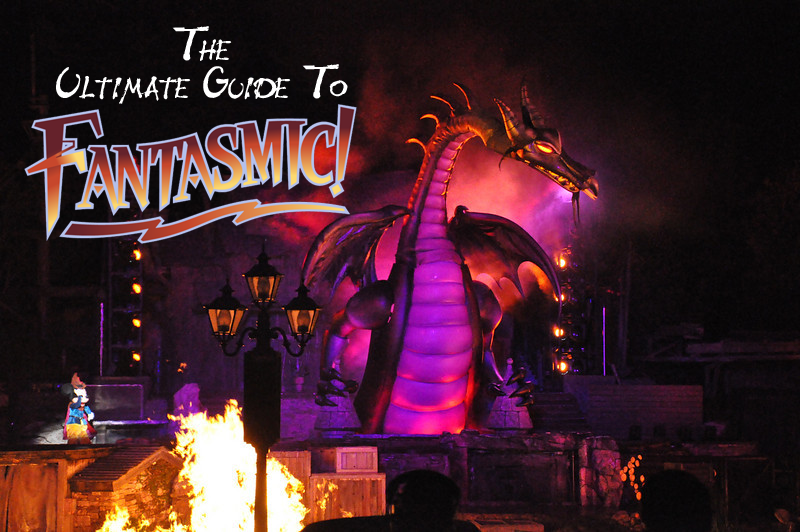 If you are short on time, but would still like to take advantage of a Fantasmic! dining package, then simply reserve a dining package from the Hungry Bear Restaurant. 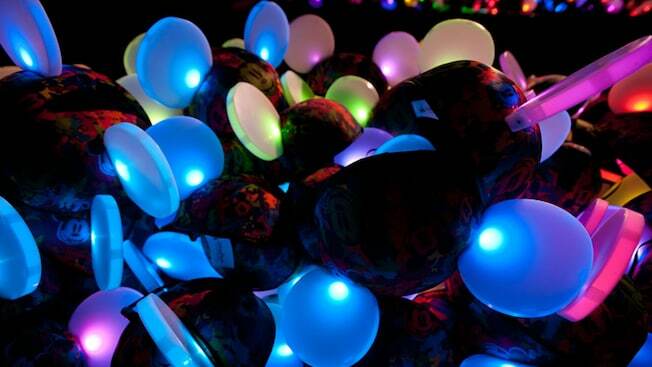 Order online or by phone prior to your Disneyland Park visit. You have the choice between 4 delicious entrees from a menu created especially for this event – cedar salt-roasted sustainable salmon, barbecue chicken, blackberry barbecue pork riblets, or mushroom and leek frittata. All dishes are served with wild rice and cranberry-apricot grains as well as kale and garbanzo bean salad. As with all Fantasmic! dining packages, all guests in each party must purchase a meal in order to receive a voucher. Viewing, with the exception of the River Belle Terrace upgrade, are located outside the restaurants. Some restaurants may allow some minor food substitutions at an additional cost, however, there is no guarantee this may be allowed. Reservations are highly recommended due to the popularity of the packages. For dinner reservations, book early in the evening (about 2 to 2 1/2 hours before show time) to allow plenty of time to eat your meal. Factor in extra time for any delays. Reserve online up to 60 days before your Disney vacation from Disneyland’s website or call 714.781.DINE. Emporium on Main Street, U.S.A.
Each Fantasmic! show comes with its own unique advantages. The first viewing is always the most crowded; however, this is the show time that you are guaranteed to be seated in your own dining package reserved seating area. During the second show time, sometimes the crowds lighten up, which is great since it is not so crowded, however, sometimes dining package seatings for this show time are combined. If you are at the first show time of Fantasmic! and fireworks are scheduled that night, then stay where you are to watch the Rivers of America put on a magical show with projections that play against the screens of water in sync with the fireworks show. Your view of the fireworks may be obscured, however, this is still a great place to be since chances are you may not make it over to the front of the castle to view the fireworks show. Be aware that Fantasmic! may be scary for little ones. The show can get bright, loud, and a bit scary at times. Blue Bayou is currently the only dining package that offers guests a complimentary seat cushion. No worries! Many gift shops around the Park have them to purchase! Since the show takes place on water, guests in front may get wet. Keep your Fantasmic! Fastpass in a safe place where you will not lose it because they are not replaceable! Know before you go! Do your research before your Disney vacation to ensure most of these fabulous deals are still available! If you are not planning on viewing Fantasmic! 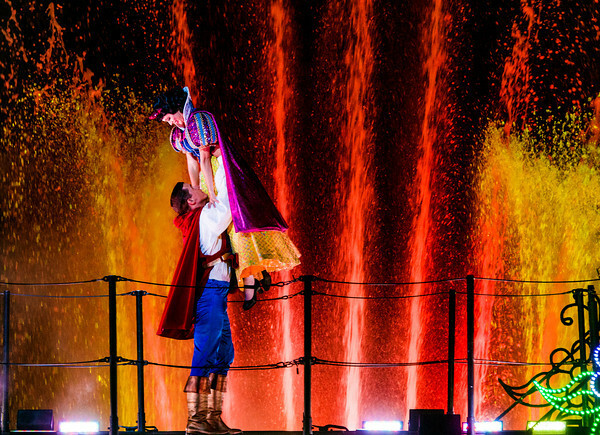 or have already seen this magical one-of-a-kind show, the best advice I have is to stay away from the area before, during, and after each show time of Fantasmic! Do not go anywhere near this area and definitely stay out of Critter Country unless you want to get stuck in a wall of people! Although Cast Members do their best to guide the crowd through, there are still the gawkers that stop in the middle of the walkway and watch the Fantasmic! show, holding up the walkway. 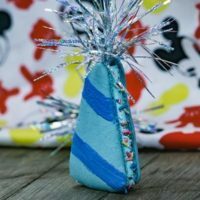 If you enjoyed this article, please be sure to “like” and “share!” For more tips, photos, and Disneyland secrets, sign up for our Disney weekly newsletter. Sign up here. 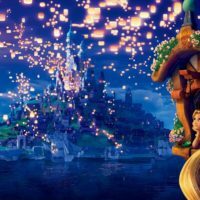 Get the Disney Dose Newsletter! Get news and history in your email. Top 8 Star Wars: Galaxy’s Edge Experiences We’re Most Excited For! 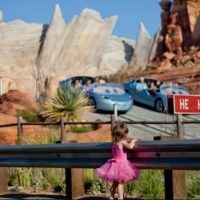 Discount Disneyland Tickets 2019 – 12 Best Ways to Save on Disneyland Tickets! Chairs? What means this chairs? When we did a Blue Bayou dinner for Fantasmic they sat us on the ground in front of the river. I would have sat there! Dad needed one! 77 yr old man & expected him to sit on hard cement for two hours! Where can we call for reservation? I can’t see it on the disney website, only the dining options appear.